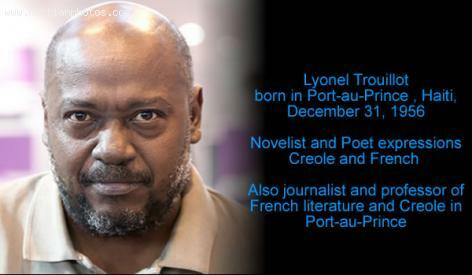 This is Lyonel Trouillot who was born in Port-au-Prince , Haiti , on 31 December 1956. He is a novelist and poet expressions Creole and French. Lyonel Trouillot studied law due to family pressure but soon realized that his passion was in writing literature. He is a regular writer in several newspapers in the country. Poet, he also published many poems. some of his works are put into music such as song lyrics for artists like Manno Charlemagne and Tambou Libète. Plolitically, he was also involved in several fights to restore democracy in Haiti. He was made Chevalier of Arts and Letters in June 2010 .